Asphalt Hot Mix Plant that we manufacture, export and supply is widely in demand amongst buyers. It features units like cold aggregates bin feeders, over size removal vibrating screen, slinger conveyor, drying & mixing drum unit, load out conveyor with anti-segregation gob hopper, bitumen heating & storage tank, mineral filler unit, fully automatic control panel, and weather proof control cabin. It is precisely engineered using high-grade parts and components. 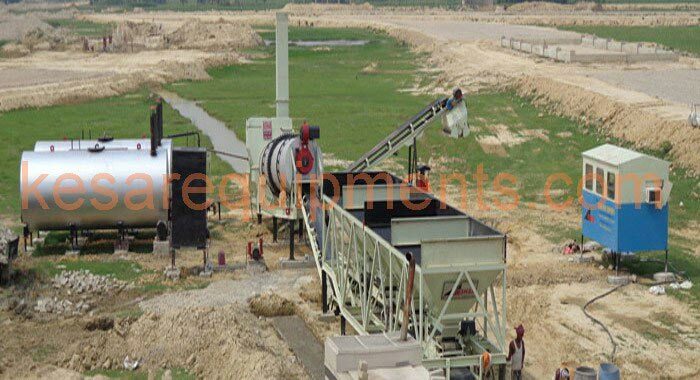 Kesar Stationary Asphalt Hot Mix Plant is the synonym for high quality. Top notch performance, lower operating costs, superb service back up translating into productivity and return in turn high profits for the customer. Conforming to international standards the DM range of Asphalt Plants also conforms fully to the latest MORTH (Ministry of Road Transport & Highway) specification. Optional attachments like Storage Silos for Mixed material, Wet Dust collector for effective Pollution control, Bitumen Heating and Storage Tanks is provided to suit specific needs. As 2007, more than 100 plants of capacity ranging from 30 to 120 TPH are in operation.